Yesterday afternoon we had guests coming for afternoon tea. No tiered cake plates and no photos of what we actually ate but here is the table set and ready. A damask tablecloth, dainty china and glassware and silver cake forks. I wanted to make a dip and my first choice was hummus which I make regularly and I always have a good result despite that fact that I do not really use a recipe. However, that was not to be as I realised I had no garlic. A little earlier I had picked a pumpkin from the garden and sliced it up ready to roast. These slices were to be used on pizzas for dinner tonight. I discovered that I had more than I would need for the pizzas so I decided to make a roasted pumpkin dip. It couldn’t be that difficult. The commercially-prepared roast pumpkin and cashew dip is very yummy. I had no cashews but found a small handful of peanuts and a few pistachios (somewhat stale) and a couple of teaspoons of sesame seeds. I tossed them all in a tray to roast in the oven for about 10 minutes then ground them in the blender. The roasted pumpkin was added and blended. The mixture was too dry for my liking so I added some olive oil and lemon juice bit by bit in equal measure until I achieved the desired consistency. The next step was the flavour. A pinch of chilli powder, 1/2 teaspoon cumin, a good grind of sea salt and black pepper and some onion flakes completed the improvisation. Here is the finished product, garnished with some coriander from the garden. As well as the dip which was served with rice crackers and corn chips, I made a chocolate slice. The guests brought some local brie and olives which were as delicious as any I have had. A pleasant afternoon with good company, food and conversation. As I sat down at my desk on Saturday morning to write a menu plan for the week, I started to think about how much planning goes into keeping our lives running smoothly. 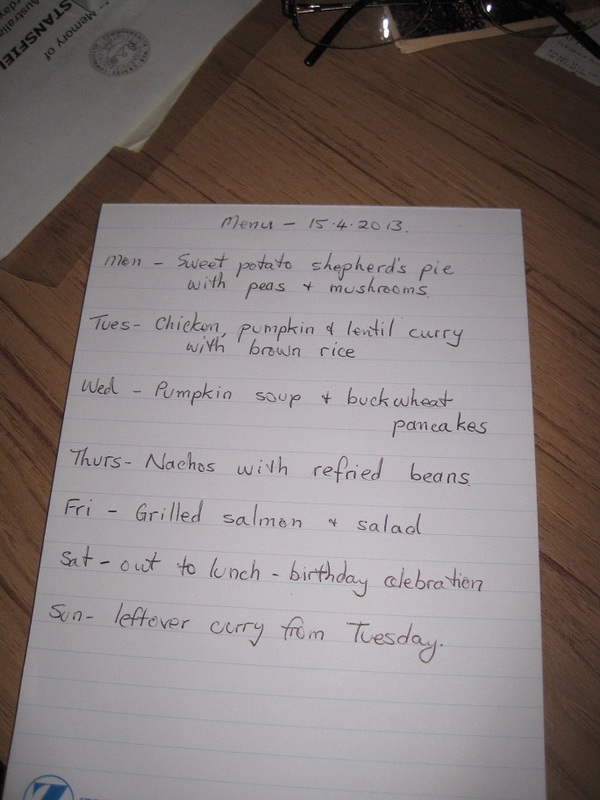 I have always menu-planned to some degree but I have now developed a routine which works for us. Every Saturday morning I write a plan for the next 7 – 10 days. I keep in mind what food I have in the refrigerator as well as what is available in the garden. From that I then write a shopping list. This generally a few basic groceries such as milk and cheese as well as fruit and vegetables. I buy meat every couple of months and pantry staples about every 3 months. We have big plans, such as our overseas trip but also small, day-to-day plans that ensure things run smoothly and we work towards achieving our goals. If this sounds like our lives are totally structured and regimented, think again as nothing could be further from the truth. Over breakfast on a Saturday morning, either The Duke or I are often heard to say, “So, what are your plans for today?” Then follows a discussion about what we have individually considered that we need to get done. It usually centres around shopping, washing, lawn mowing and the like. The next step is to plan. On Saturday morning we had to take the dog to the vet at 8.30am so we decided to leave the shopping until Sunday morning and do some outdoor work. We needed to finish by 4.30pm so we could be cleaned up and head off to dinner and the movies by 6pm. 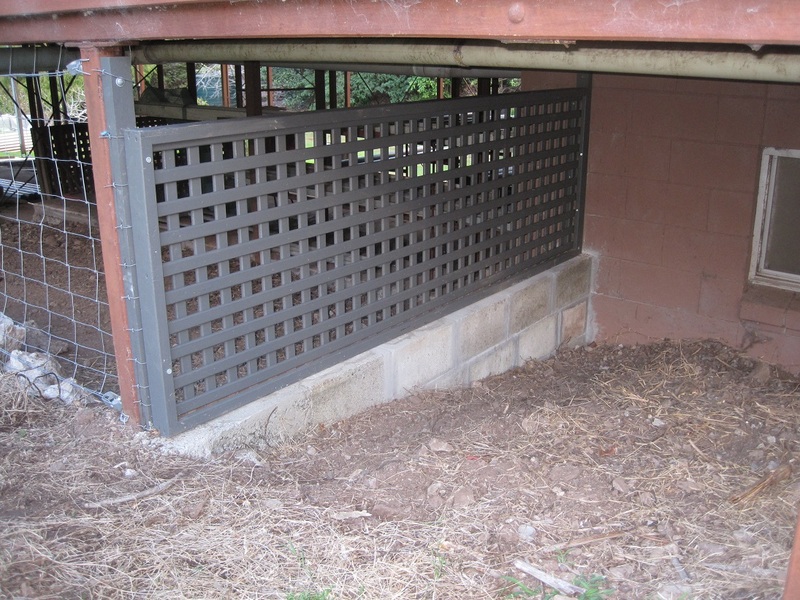 We planned our outdoor work and achieved a real sense of satisfaction when the jobs were done. All of the piles of mulch were collected from various spots around the yard, we weeded and mulched the garden bed beside the front steps. The Duke lightly pruned the roses and we planted 5 more pineapple tops. The remainder of the mulch was spread under the native shrubs on the front verge. Since it was drizzling with rain most of the day we then adjourned under the house to start on one of the other jobs on the master list – covering the area which is bare dirt under the verandah with pebbles. The original plan was to build 3 more low retaining walls to create stepped levels to hold the pebbles in place, however, we have decided to retain the sections using some timber sleepers. We will also place some along the outside edge to separate the pebbled area from the garden bed outside. We have calculated how many sleepers, how much weed mat and the volume of pebbles that we will need to complete the job. The ground has been dug out and is almost at the levels we need so I hope we can get this finished over the next few weeks. Sunday was a different story. I did the ironing early, before we went to do the shopping in a couple of different locations and came home with the intention of more outdoor work. One simple message on the answering machine changed that. A friend had left a message to ask us to come for drinks at 4pm, so I amended the menu plan as I knew we would have plenty of late afternoon/evening nibbles. I then spent the rest of the day in the kitchen. I made pizza bases, wraps for our lunches and a chocolate cake (all gluten-free). I made 1 pizza and took that and the chocolate cake with us that afternoon. The remainder of the pizza bases are partly pre-cooked and in the freezer. So, to round off a fairly long-winded story, I think it is important to have a plan, otherwise things can turn into a disorganised jumble and you end up wasting a lot of time. The organisation that results from these plans allows you the flexibility to change those plans to accommodate things that arise out of the blue. What do you think? It is very easy to be consumed by the merry-go-round of our lives – work, bills, mortgages, our homes and the never-ending chores. Yesterday was about the really important stuff – spending time and sharing a meal with some of my extended family. We hosted a BBQ for about 20 of my cousins and partners. I had hoped to arrange it for before Christmas but there is always many social occasions at that time of the year that I decided to make it for the New Year. It was a special time that I will cherish for a long time. I have some very close friends but for me, the saying “blood is thicker than water” rings true. We do not see each other terribly often but the sense of shared history creates a strong bond that endures across time and distance. It is important to nurture that bond by taking time in our busy lives to stop and re-connect with those who are important to us. I know that not everyone has the luxury of a close bond with their families which only serves to remind me of how fortunate I am. Do you have family or friends who are an enduring presence in your life? How do you maintain these relationships?